The LexisNexis Firm Manager dashboard. The industry newsletter TechnoLawyer publication assessed the product a “TechnoScore” of “A” based on the conventional letter grading system in a published review. 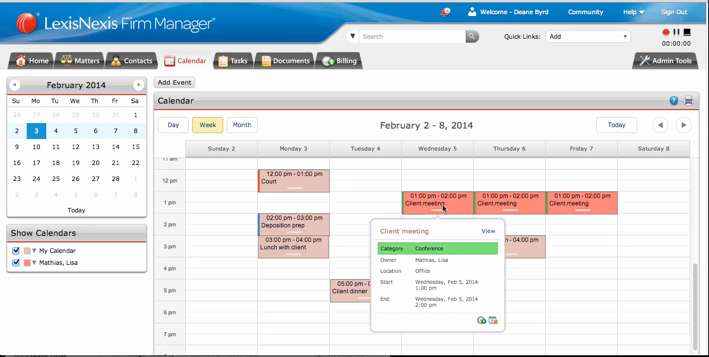 LexisNexis® Legal & Professional, a leading provider of content and technology solutions, announced today the LexisNexis Firm Manager® online practice management software, earned first place in National Law Journal’s “Best of 2015” products in the category of “Docketing & Calendaring Software”. 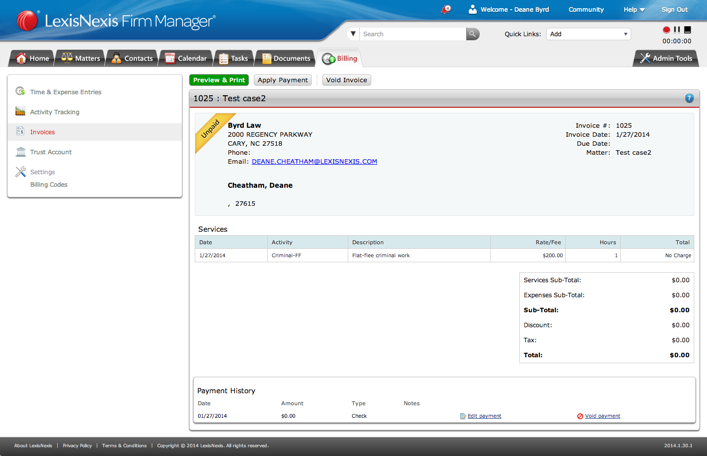 The Firm Manager product is also the only online practice management tool with the “Money Finder” feature that automatically searches and sorts through tasks, meetings and documents created in the Firm Manager application and flagging those that have not been associated with a client bill for review. The Firm Manager team has consistently released a continuous stream of enhancements and new features over the course of the last twelve months. The updates have included integration with commonly used calendar systems among attorneys in small law firms and have been especially responsive to market requests and demands. A study conducted last year demonstrated that law firms are increasingly warming up to cloud solutions, with 72% of attorneys indicating they were more likely to use such tools. Attorneys responding to the survey cited “mobility or freedom of access” and “disaster recovery/data backup” as the driving factors in moving toward cloud tools. From data technology products and banking services to law firm marketing and legal research, the “Best of The National Law Journal” Reader Rankings showcases the top vendors and law schools, providing lawyers and legal professionals with insights into the preferred providers in today’s legal market. To view the special report, please go to http://www.nlj.com.